May has by and large been a month of glorious blue skies and warm sunshine. It has been a relatively dry month, bar a few days of bleak grey skies and drizzly rain. We even had a couple of massive downpours to compensate for an otherwise summery feel to the month. 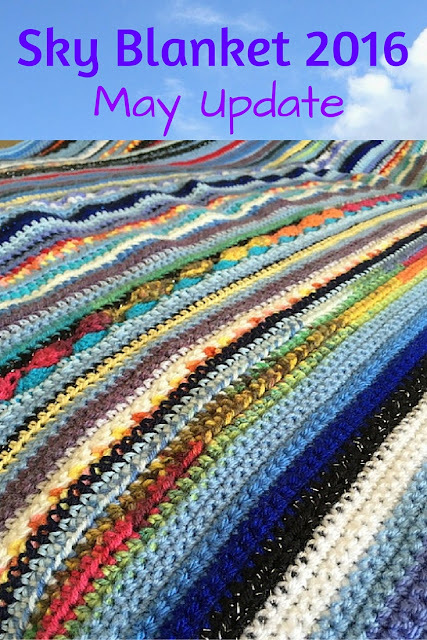 Here is a snapshot of the May skies that were the inspiration behind this month's crochet. In keeping with the experiment that is my Sky Blanket, I went for an ombre effect with the blues this month. I opted to crochet two rows of each shade of blue from my selection of yarn. Here are the details of this month's pattern, from top to bottom, in case you fancy crocheting along. 24 - DC- chain- DC- chain- DC in variegated red/orange (Vermont), hook 5 for a stunning red-gold sky at sunset. This is similar to a row I did last month. 29 - half trebles in variegated blue-green yarn (Patons Fab DK Aqua colour), hook size 5 for the day we visited Geronimo. Wow the sky blanket is coming along nicely it's very pretty with all the colours. What a wonderful idea, the blanket is going to be beautiful nad something that you can keep and pass on. It looks gorgeous - I would never have the patience to do something like that! I love how sunny it has been giving us some beautiful skies! Lovely blanket made out of a great inspiration idea! It's looking beautiful, such fantastic colours!